Pinky and the Brain have a lot in common with the church. Pinky and the Brain was an animated television show back in 1995 that featured two laboratory mice. As the show’s opening song described them, one was a genius, the other insane. The show opened every episode with Pinky, the insane one, asking Brain the same question, “Gee, Brain. 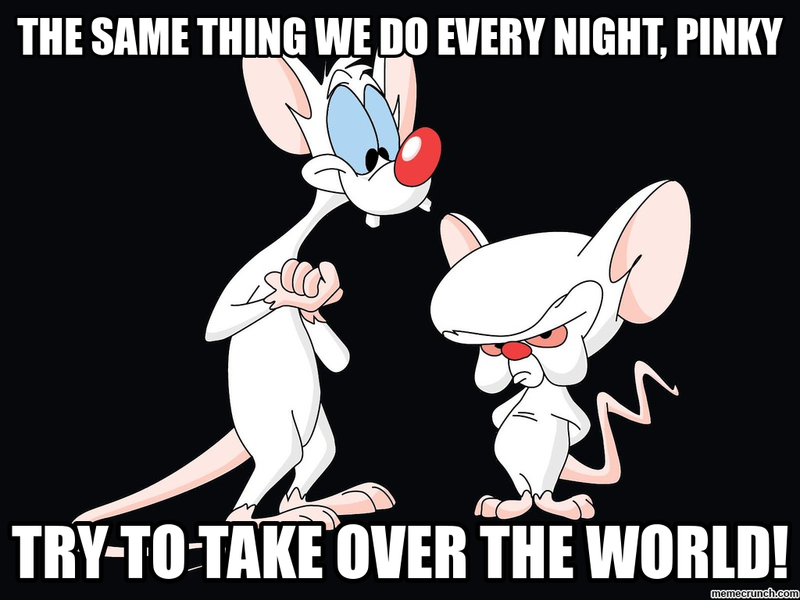 What are we going to do tonight?” And Brain would respond, “The same thing we do every night, Pinky – try to take over the world!” In that way, Brain and the church have the same goal – to take over the world. We just plan do to do it differently. It’s not a task we can accomplish alone. As brilliant as Brain is, he still needs Pinky and in the same way, no one pastor or one person can bring the world to Jesus by themselves. Although it sounds trite, it does in fact take a village, or a community, to do the job. Just look at your favorite sports teams. We just saw the Golden State Warriors win the NBA Championship and as great as “Steph” Curry is he didn’t score every point or make every steal. He didn’t even win the MVP of the finals. The same is true of other great sports teams. Look at the Giants winning the championship last year. On paper, there’s no way they should have won, but you don’t play the game on paper. You play it on the field and that team came together at just the right time and in just the right way to take the World Series. There wasn’t any one player you could point to who did it all. Madison Bumgarner may have won the MVP and deservedly so, but he couldn’t have won without someone scoring those runs. Likewise, Jordan had Pippen. 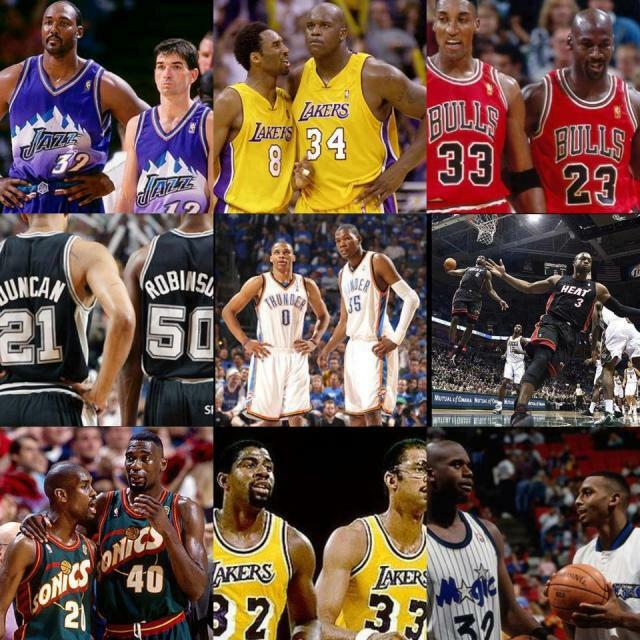 Shaq had Kobe (or maybe Kobe had Shaq). Montana had Rice. And the list goes on and on. Even athletes in individual sports have coaches and trainers and people supporting them. Writers have editors. Chefs have sous chefs. And pastors have their congregations. No one, no matter how talented or great, can do it alone. That’s why we join the church; to lend our talents and gifts to the effort. 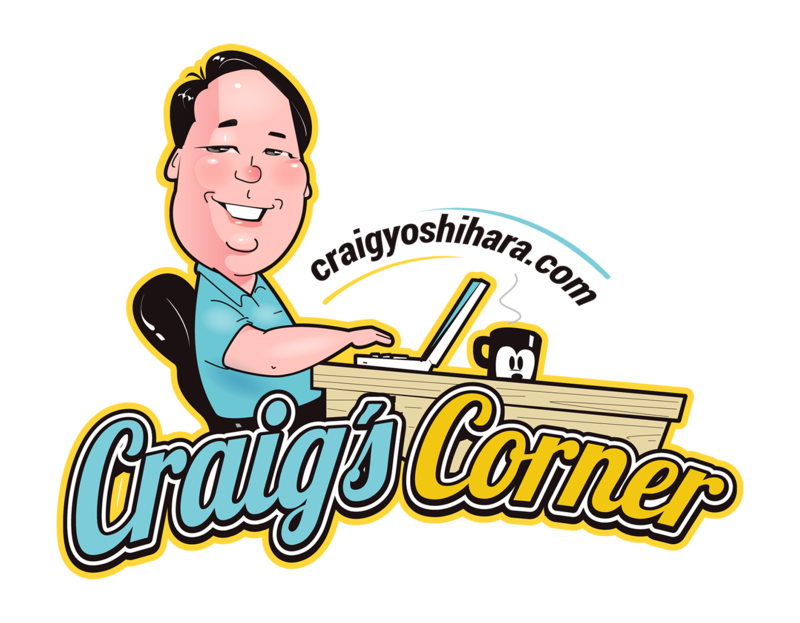 To become part of the team that is poised to take over the world. Because if we take seriously the words of Jesus, we can’t ignore that he tells us to baptize all the nations and there is no way any one of us can do that task alone. We are stronger as a group. We have more resources, more knowledge, and more support as a group. We build each other up and carry each other’s burdens. We may not all be Michael Jordan or even Scottie Pippen. Maybe we are the Steve Kerr of the team, and you see how well he turned out. We also join the church so that we can become better Christians. We find a community that we fit into and we dive in. We don’t suddenly accept Jesus as Lord and Savior and “BAM” become imbued with all the wisdom of Christianity. The wisest Christians I know, Cassie’s grandparents, read the Bible over and over and continue to get something new out of it each time. And in their humility, I know they would say they still have some rough edges. In comparison, I must be like a jagged rock. We enter into these communities to smooth out our rough edges, to help us grow stronger in our faith and understanding of God. Other people have views and opinions that help to refine our own. Other people have ideas we’ve never even considered. And together we help to shape and mold each other in our faith. We study the Bible together, we interpret God’s actions in the world together, and we hold each other accountable. In fact, the entire reason John Wesley founded Methodism was to do exactly that – hold each other accountable. Each person was required to join a small group that would meet regularly and at each session they went around and answered the question, “How is it with your soul?” And each person was expected to answer honestly. The others would help support them through difficult times and would celebrate in good times. But Wesley thought it was important for us to be accountable to one another. And that’s why we join the local church to build each other up in our faith so that together we can take over the world with the love of Jesus Christ. We join the church to build each other up in our faith so that together we can take over the world with the love of Jesus Christ. But being human, we sometimes misunderstand the role of the local church. We see it as “our” church. We see it as “our” building, and “our” traditions, and “our” chairs and tables and plates. And our thinking becomes very narrow. Paul addressed this in his letter to the church at Corinth which we are reading from this morning. If you have your Bibles or a Bible app on your phones, please go to Paul’s first letter to the Corinthians, chapter 3 beginning with verse 1. 1 Corinthians 3:1. Paul is writing to the church because something very bad is happening. Different factions are beginning to form and people are beginning to argue over who they should be following, whose words to lift up as doctrine. Some are claiming to follow Jesus, but some are claiming to follow Paul, some are following Apollos who we know from Scripture was a very influential teacher and leader, and some are following Peter. Sounds like us today. Some follow Jesus, but some believe only their way of baptism is acceptable to God. Some believe that God has already selected who gets to go to Heaven. Some believe that communion shouldn’t be offered to all believers. So Paul is writing to warn them of such foolishness and encouraging them to act as God’s people together. Paul scolds the church members for failing to see the obvious. All of them – Paul, Apollos, Peter – all of them are simply servants of God. Even though each one of them has contributed something unique and different to their understanding of Christ, ultimately they all are servants of the same God. Paul comes down on the people of the church for not seeing this and essentially elevating the individual disciples over Jesus. The members of the church are arguing about who should be following whom instead of concentrating on bringing people to faith in Christ. Sometimes we do the same thing. We become envious or jealous of other churches who are succeeding. We try to copy their ministries in the hopes of bringing people to our church instead. But what we should be doing is finding that unique space in our communities that we can fill, to find that unique quality that makes our church stand out. Not to make ourselves “better” than the other churches, but to ADD to the ways in which all of our churches add to the community. We should find out what makes us unique, not to be BETTER than other churches, but to ADD to the ways ALL of our churches add to the community. In this way we are completely different than sports teams. Our winning has nothing to do with other churches losing. Each time any of us wins, we all win because God wins. Each time any of us wins, we ALL win because God wins. You’ve promised to join a community of like believers who offer something unique to the community and to one another. 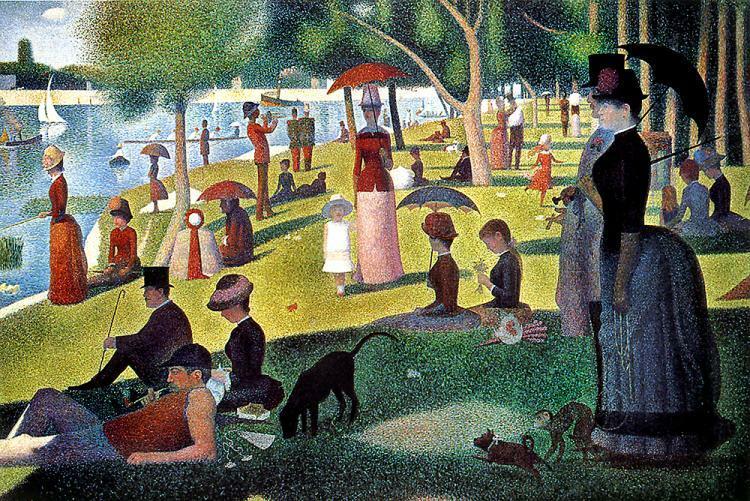 Our churches are like the dots in George Seurat’s “Sunday in the Park With George.” If you’ve ever seen that painting, you know that it’s made up of thousands of tiny dots. Literally tiny dots. Our churches are like those dots. Each one contributing to the whole, but only together do they make a beautiful painting. Likewise, without the dots, there is no painting. If the painting is missing a section of dots, it looks incomplete. We commit to being a part of one of those dots. Individually, our community is important, but its importance is largely because we are part of that painting. Together, we make the painting complete. We solidify that commitment by taking vows before the congregation when we join the church. Like wedding vows and baptismal vows, our vows of membership are a public way for us to express our faith in Christ. It says in the letter to the Romans, “If you declare with your mouth, ‘Jesus is Lord,’ and believe in your heart that God raised him from the dead, you will be saved. 10 For it is with your heart that you believe and are justified, and it is with your mouth that you profess your faith and are saved.” By coming before the congregation we are doing just that, declaring with our mouths that Jesus is Lord. We’re giving voice to what we already believe in our hearts. So as we take on the larger commitment to baptize all nations, that journey begins in our local church. As Dr. Stamm wrote in his summary of membership, “…the United Methodist membership vows call us to make the world our parish one neighborhood at a time.” The United Methodist membership vows call us to make the world our parish one neighborhood at a time. Like them, we are out to take over the world. But we don’t do it for our glory, but for God’s. And unlike basketball, baseball, football or hockey, we don’t win at the expense of others. In fact, if the mission of the church was like a playground game, it would probably be Red Rover. The game isn’t over until everyone is on our side and then everybody wins. In remembrance of those vows we took when we joined the church, let us stand and reaffirm them together. Will you renounce the spiritual forces of wickedness, reject the evil powers of the world, and repent of your sin? I will. Will you accept the freedom and power God gives you to resist evil, injustice, and oppression? I will. Will you confess Jesus Christ as Savior, put your whole trust in his grace, and promise to serve him as your Lord? I will. Will you remain faithful members of Christ’s holy church and serve as Christ’s representatives in the world? I will. Will you be loyal to Christ through The United Methodist Church and do all in your power to strengthen its ministries? I will. Will you faithfully participate in its ministries by your prayers, presence, gifts, service, and witness? I will. Then let us give thanks together for God’s work in us. We give thanks for all that God has already given us. As members of the body of Christ and in this congregation of The United Methodist Church, we will faithfully participate in the ministries of the Church by our prayers, our presence, our gifts, our service, and our witness, that in everything God may be glorified through Jesus Christ. Amen.